Earlier this year, I spent time at Chestnut Hill Academy in Bellevue working with 5th Grade students to make two quilts. This blog features one, The Rain Forest, and my blog last week featured the other, The Ocean. In their science classes they were studying different habitats and each child selected an animal for detailed study. 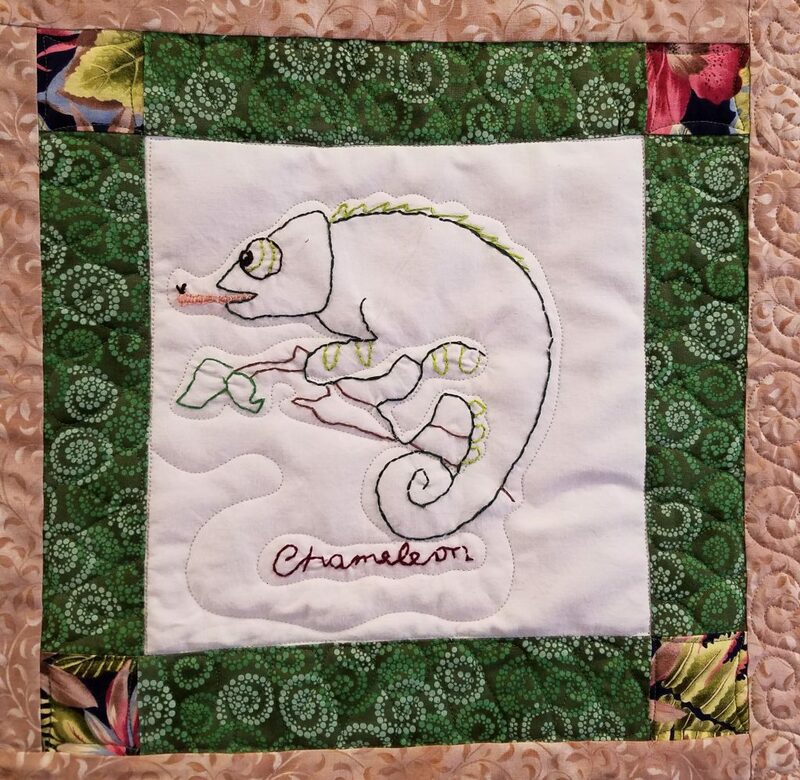 They made line drawings of their animals on 10″ quilt blocks and then spent 2-3 weeks hand embroidering. We were delighted with the results and the enthusiasm with which the kids embraced this project. The embroidery was challenging for some, but they all enjoyed it and persevered. When the blocks were completed, I took my sewing machine to school and worked individually with each child as they machine stitched the block frames. They were proud of their work and so were we. Here are a couple of detailed shots. The children determined the block layout and decided to arrange it according the height of rain forest which each animal occupied, hence the canopy dwellers are at the top of the quilt and the ground dwellers at the bottom. I assembled the quilt top and Wanda Rains machine quilted it. 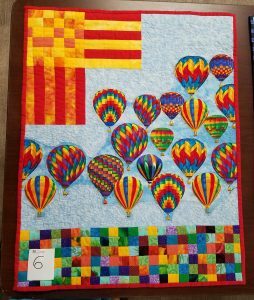 The quilt was auctioned at a school fundraiser the proceeds of which go towards special projects and field trips to enhance the curriculum. The two quilts raised just over $5,000! For me, the educational value was enormous and the money generated at the auction was just the icing on the cake. Earlier this year, I spent time at Chestnut Hill Academy in Bellevue working with 5th Grade students to make two quilts. This blog features one, The Ocean, and my blog next week will feature the second, The Rainforest. In their science classes they were studying different habitats and each child selected an animal for detailed study. 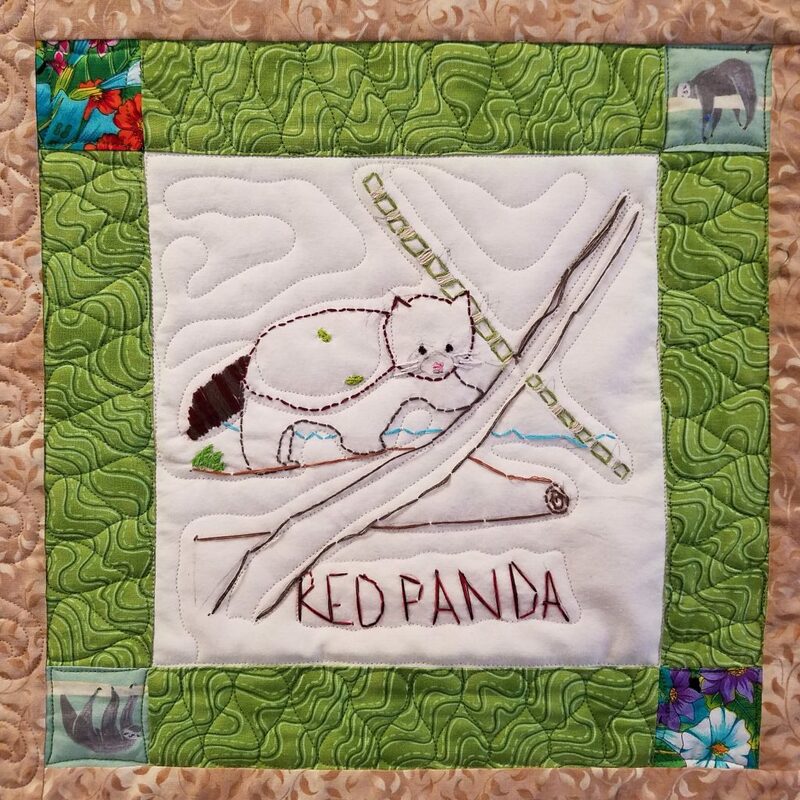 They made line drawings of their animals on 10″ quilt blocks and then spent 2-3 weeks hand embroidering. 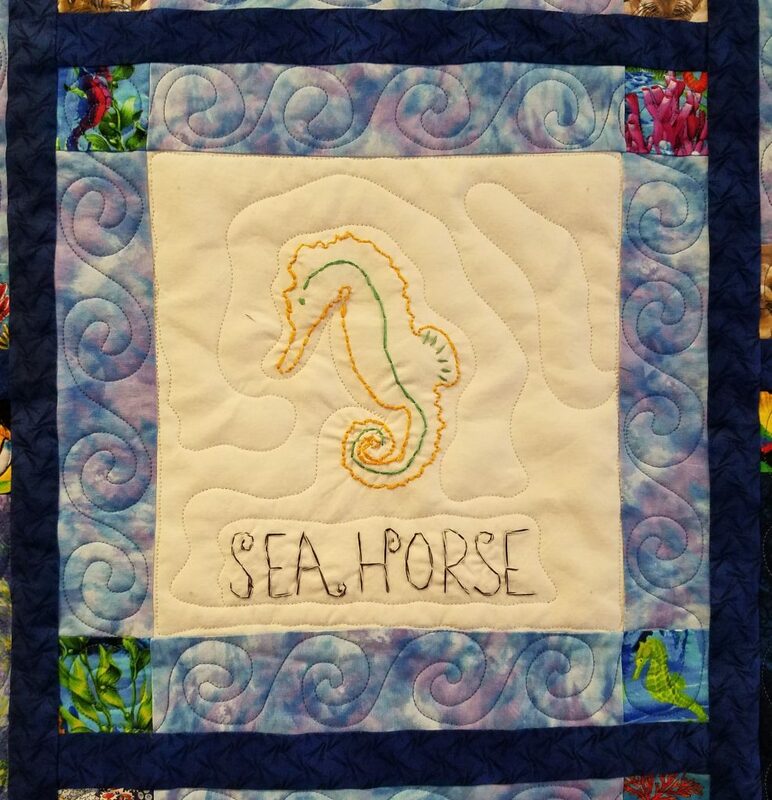 The children determined the block layout and decided to arrange it according the depth of ocean which each animal occupied, hence the surface dwellers are at the top of the quilt and the deeper dwellers at the bottom. I assembled the quilt top and Wanda Rains machine quilted it. 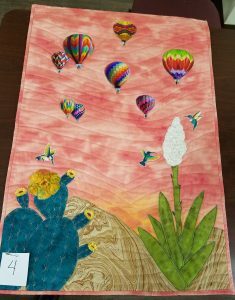 The quilt was auctioned at a school fundraiser the proceeds of which go towards special projects and field trips to enhance the curriculum. The two quilts raised just over $5,000! For me, the educational value was enormous and the money generated at the auction was just the icing on the cake. In August, Elaine Percival, Barbara Peterson and I will be traveling with Selenge Tserendash in rural Mongolia after assisting at the Third International Mongolian Quilt Show celebrating the 15th Anniversary of the Mongolian Quilting Center in Ulaanbaatar. We plan to visit rural hospitals and take baby quilts to the maternity wards to give as gifts to mothers for their new babies. 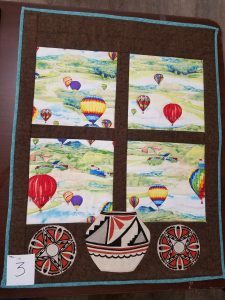 Would you like to make a baby quilt to send to Mongolia? 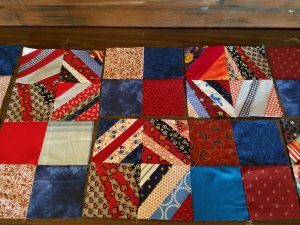 We are hoping to make 50-60 quilts, so would love your help. 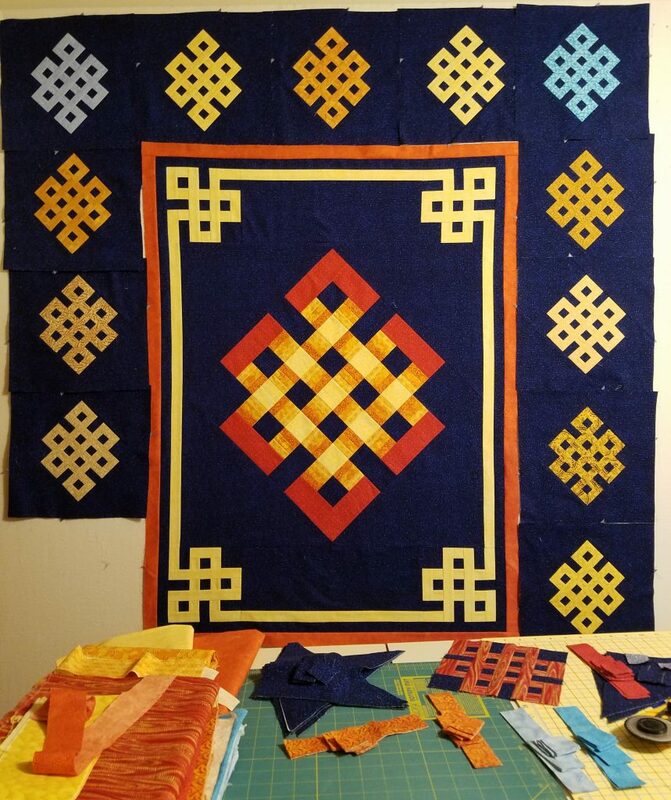 The quilts should be completed by the end of May and will be sent to Mongolia in a container in early June, taking about a month to get there. Any late arrivals will be carried in our suitcases, with the final deadline of 10th July. The recommended size is in the range: 32-38” x 36-48”, square or rectangular. The Mongolians love brightly colored prints, which of course are unobtainable in Mongolia. Please contact me if you are interested in participating in this project. If you live locally, (near Bainbridge Island, WA), and need help getting started, you may visit my studio and I’d be happy to supply the fabric and a simple pattern. The response to this project has been amazing! Thank you to all of you who have contributed baby quilts. Our goal of 50-60 has already been exceeded! The container for Mongolia is actually leaving in early May, and not June as stated above. The completed quilts will receive a special blessing on 28th April before being packed in boxes to go into the container. They should reach Mongolia by mid-July. They will be displayed in the quilt show before we distribute them to the babies. Any baby quilts that I receive after 1st May will travel in our suitcases. Thanks again for your support. I’ve begun my next large project, a quilt for my nephew. I have five nephews and nieces and am making quilts for all of them for their 21st birthday gifts. Matthew’s is the fourth, and since he’s already turned 25, I’m running behind schedule! He looked at my website to see what kind of quilt he’d like, and was really drawn to the Gateway to Mongolia pattern because it looked Celtic. Who knows where this pattern originated, but it has been around in Mongolia since before the era of Genghis Khan 800 years ago. In Mongolia, the Olzii is painted on the doors of gers (yurts) to bring long life and prosperity to the inhabitants. It also drives away wild beasts and evil spirits. It is one of the Tibetan Buddhist special symbols, a never-ending knot signifying the eternal universe and continual cycles of life and death. The pattern is indeed typical of many Celtic under-over designs and I’ve also heard it called a Gordian Knot. A few years ago, I went to an exhibit of Islamic art in London at the British Museum. There was an Abyssinian tile from the fourth century with this pattern, so it clearly has significance in many parts of the world and has been around for a long time. I achieved the woven effect by using a color gradation of fabrics on the large on-point central Olzii block. The simple Olziiis surrounding the center field are 12″ blocks and will be trimmed slightly to fit. I will sew another orange strip around the outside and an additional pieced border yet to be determined. Watch this space in a couple of months for the finished quilt…. Work in Progress (4), now finished! Over the past several weeks, I’ve posted pictures of this quilt in various stages of development. 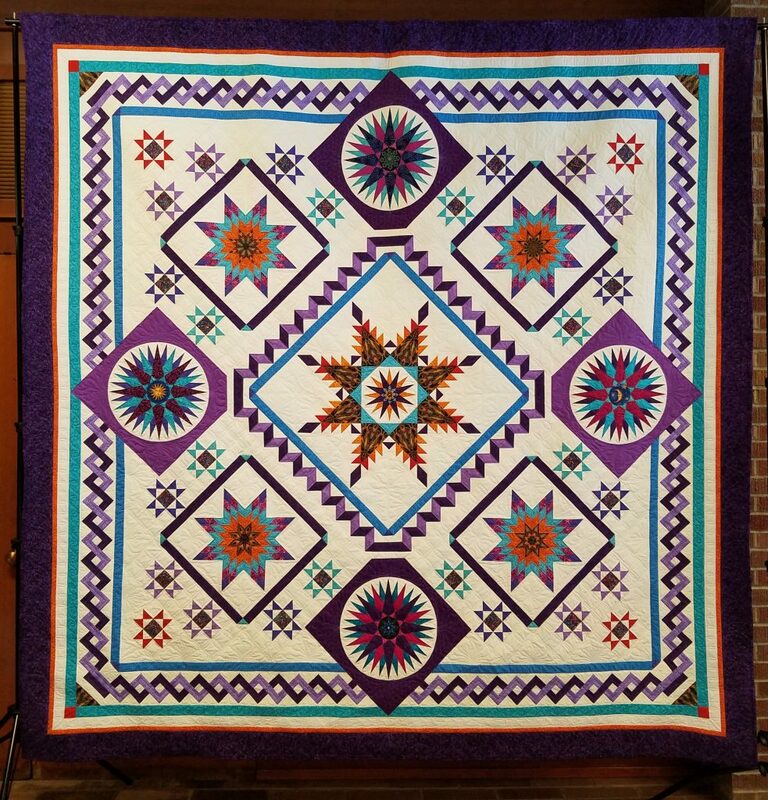 Lauret’s Stars, is at last completed, after 20 months and over 200 hours of piecing. With our quilt show being cancelled, I was unable to photograph this commissioned quilt at the quilt show. Instead, I took it to church and set up my quilt stand in the parish hall where there was plenty of space and light. This is one of the largest quilts that I’ve ever made, at 105” x 105”. 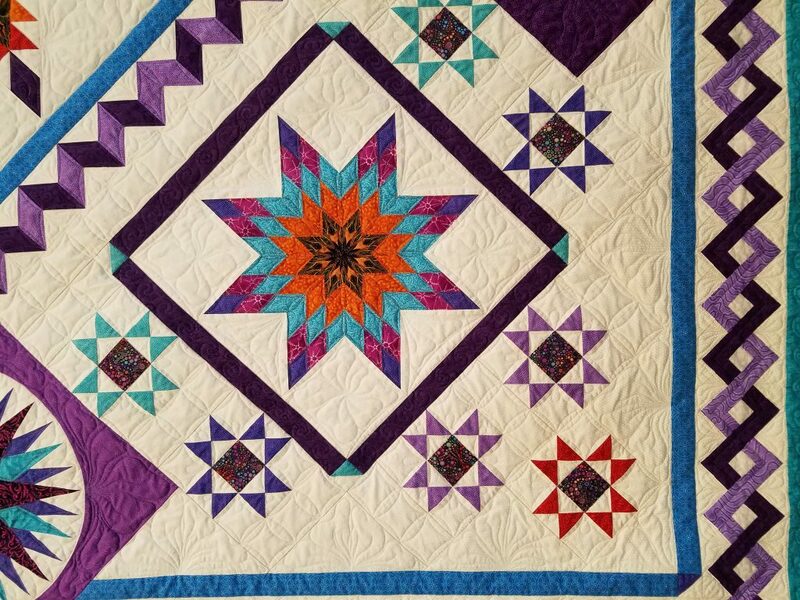 My friend, Wanda Rains, did a spectacular job on the custom long-arm quilting. 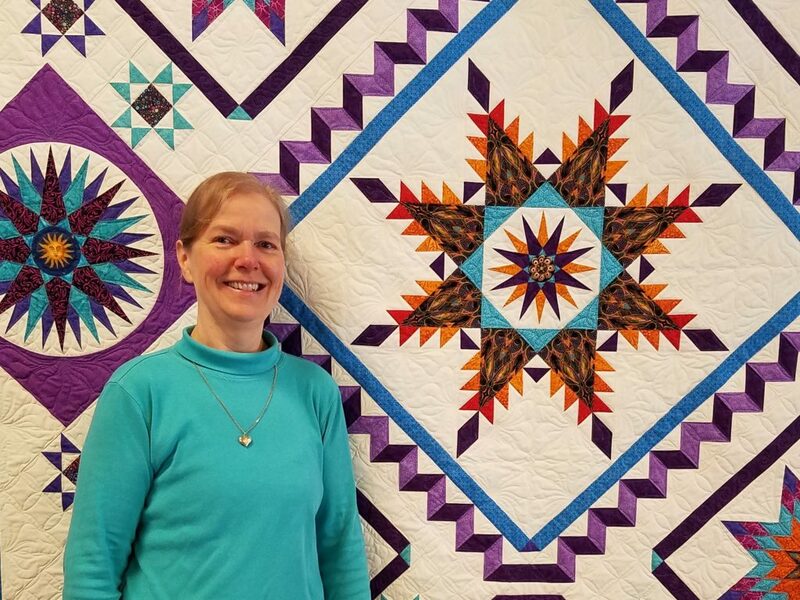 I’m happy to report that my client is thrilled with the quilt and has given me permission to borrow it back from her so that it may be displayed in our rescheduled quilt show in May. Here I am up close with it. Here’s another detailed shot so that you can see some of Wanda’s exquisite quilting. 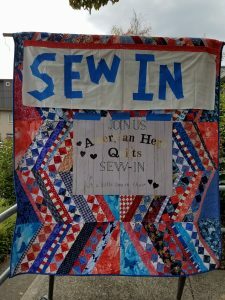 Last week I shared a poster promoting our upcoming Kitsap Quilters’ Guild show on Friday and Saturday of this week, 15th and 16th February, (snowy weather permitting). 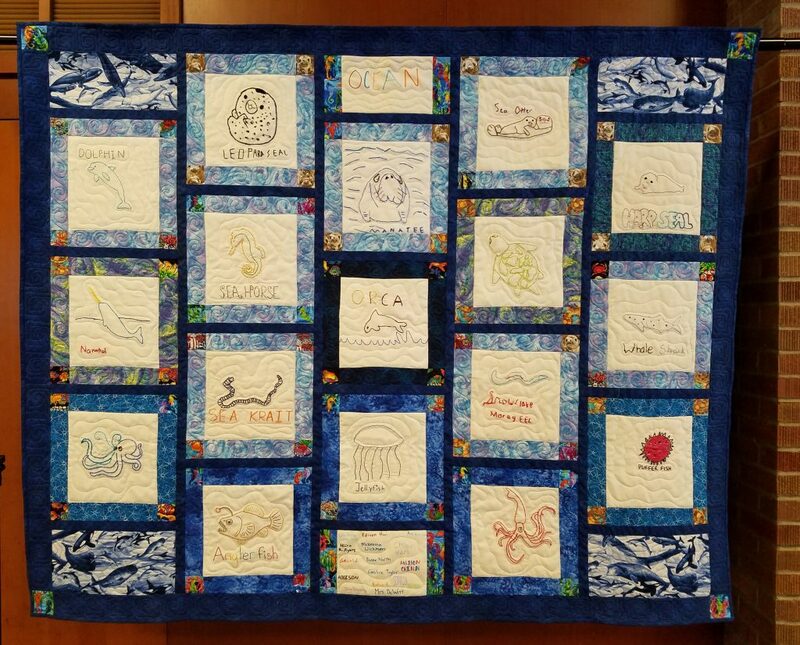 The poster shows a small portion of the beautiful raffle quilt. I wanted to share the whole quilt with you in all its glory, so here is the full-sized picture, photographed by Richard Thornton. This certainly echoes the theme of our quilt show, “Stitches of Love”, reflected by the hours of hand appliqué that went into making this gorgeous queen-sized quilt. Ann Trujillo and Margaret Mathisson chose the design and coordinated the project. 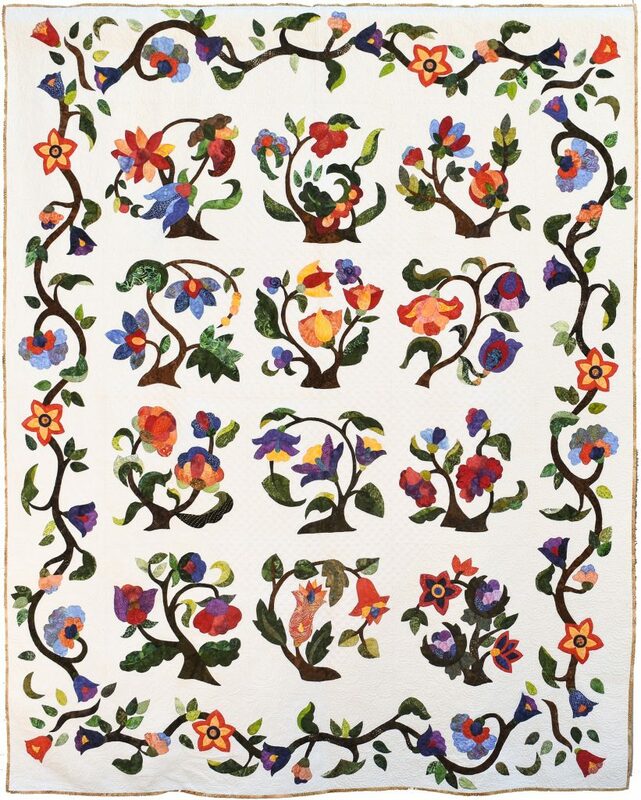 The pattern is Jacobean Appliqué by Pat Campbell and Mimi Ayers. Twelve guild members pieced the blocks and another four assisted with borders and the quilt top assembly. 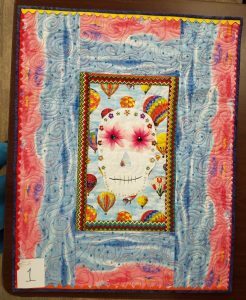 The quilt was machine quilted by Jackie Heckathorn. 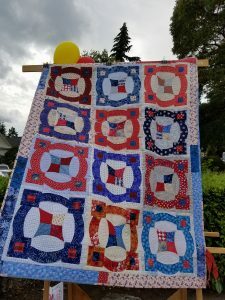 If you are able to attend our quilt show at the Kitsap Fairgrounds in Silverdale on Friday or Saturday, you will have the opportunity to purchase chances to win this lovely quilt. The drawing will take place at our guild meeting on 26th February and the winner will be contacted by phone (unless at the meeting!). As we approach Veteran’s Day, it seems appropriate to remind you all of the opportunity to make patriotic quilts for wounded veterans or for family members of veterans killed in action. American Hero Quilts is one such group that does this. 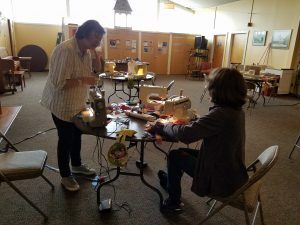 At our Bainbridge Island Quilt Fest in September, sponsored by the Bainbridge Island Modern Quilt Guild, there was a Sew In to make quilt blocks for a quilt to donate to this group. 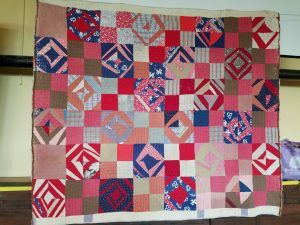 Anyone could participate to sew simple 4-patch blocks, or string-pieced blocks to make a replica of this antique quilt using patriotic colors. The new blocks are much more vibrant in color, the antique quilt having faded with age. This project was coordinated by Marybeth O’Halloran and Barbara Kirk. The American Hero Quilts organization was established in 2004 to provide recognition and appreciation to wounded service men and women who served in the Iraq and Afghanistan wars. Each quilt as a metaphoric hug and a way to express gratitude for their service to our country. 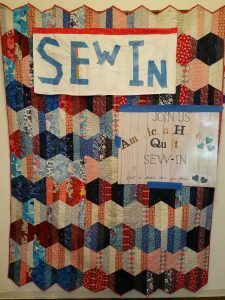 There are now over 800 volunteers participating in the program, ranging from piecers, binders, quilters and other helpers, including generous contributors. As of the first of the year in 2018, over 26,500 quilts had been provided to deserving men and women and their families. 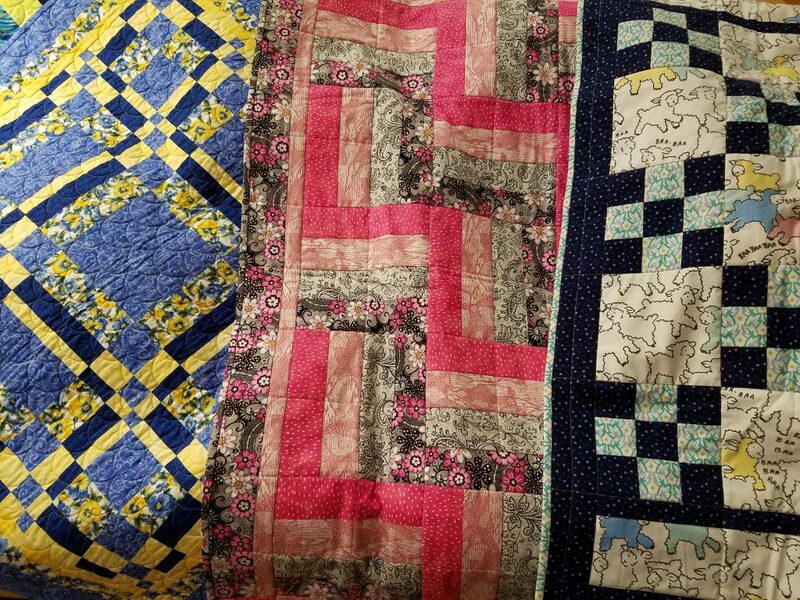 The quilts are sent to Madigan Hospital at Joint Base Lewis McCord, other Warrior Transition Centers in the US, and directly to bases in Afghanistan. 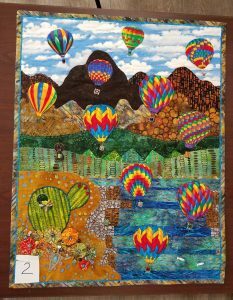 I recently taught at the New Mexico Quilters’ Association in Albuquerque. The big buzz at their meeting was the upcoming Balloon Fiesta, an annual event that takes place for nine days in early October in Albuquerque. 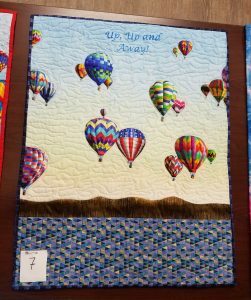 The guild runs a booth at this event, where they sell tickets for their raffle quilt and have a variety of balloon themed quilted items for sale. It is their major fund raiser for the year. 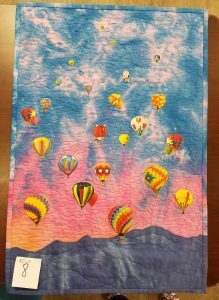 They had a balloon themed challenge and these delightful quilts were the entries. Members voted on their favorite at the meeting, hence the quilts just have numbers on them and the makers were not identified. I don’t know which one won, but I thought they were all pretty creative. The winning quilt received a prize. 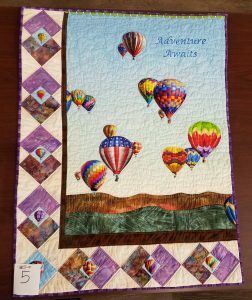 All the quilts were donated for sale at the upcoming Balloon Fiesta to benefit the guild. They were whimsical and fun. 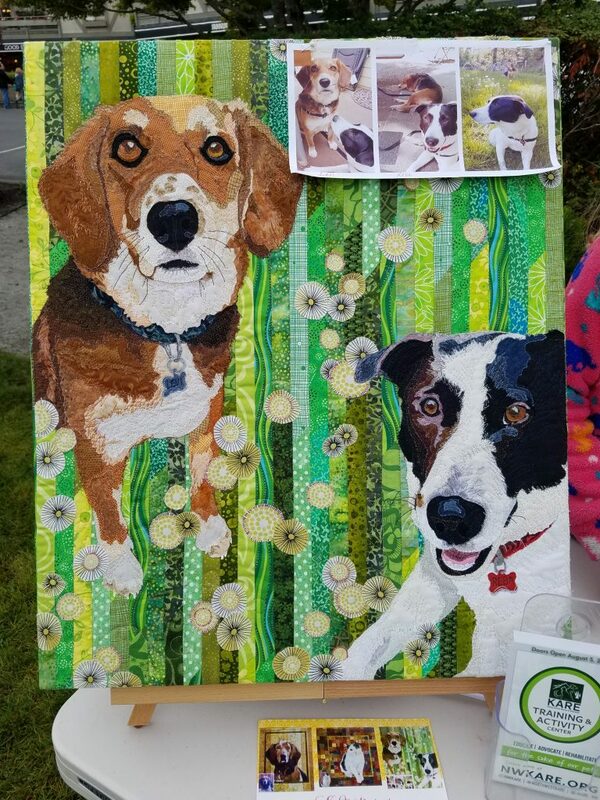 Purely coincidentally, on the day of the Bainbridge Island Quilt Fest, there was a small fair with tables on Winslow Green for animal lovers. There were adorable kittens and a couple of dogs out for adoption, a pet food stand and more. One table had this beautiful quilted pet portrait. 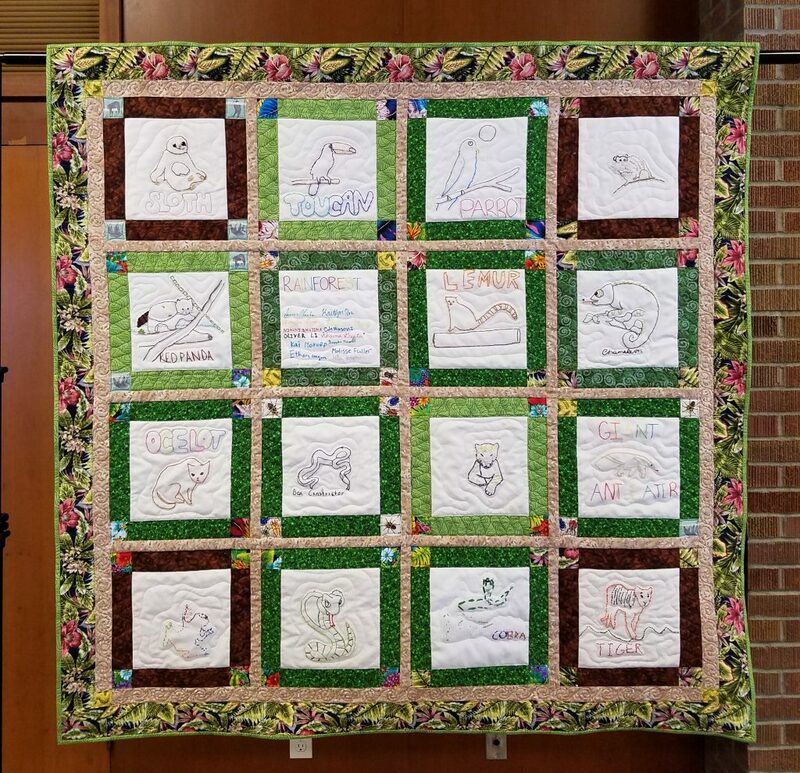 Raffle tickets were offered for $5, and the winner will be given the opportunity to provide a picture of their pet to be memorialized in a customized quilt made by artist Dawna Ellis. I think Dawna does an incredible job at bringing these dogs to life on the quilt. The raffle is in aid the Kitsap Animal Rescue & Education organization. 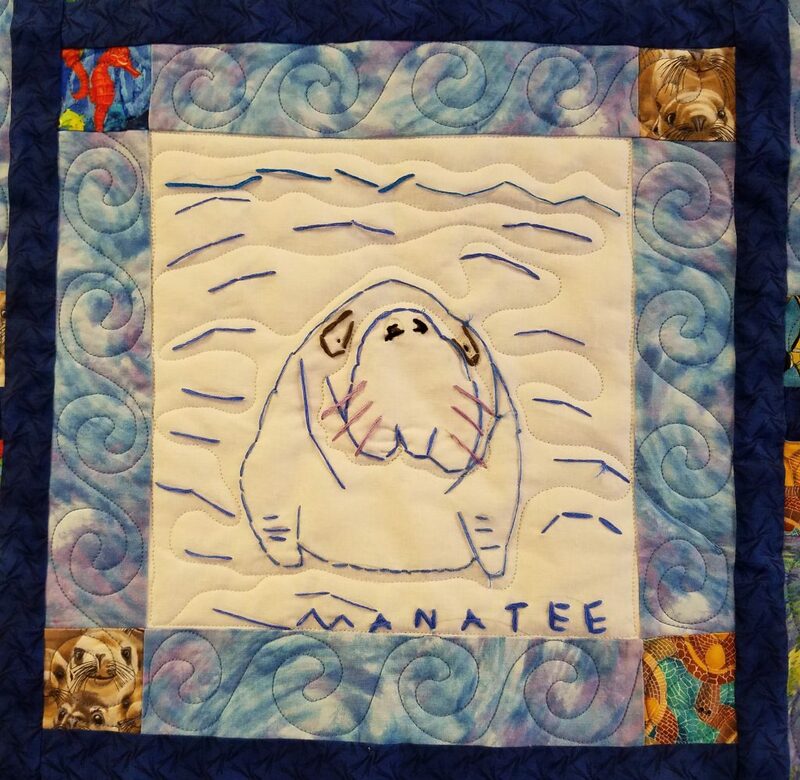 Dawna makes a variety of pet quilts for her clients and always donates 10% of her fee to a pet shelter or rescue organization of the client’s choice. She may be contacted at dawna.nest@gmail.com. 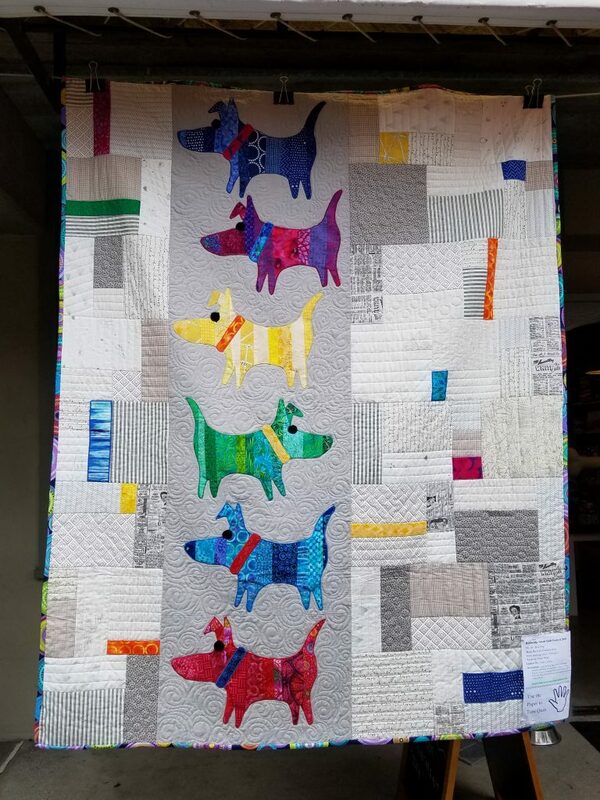 Hanging nearby, was this delightful whimsical dog quilt, Mod Dog, made by Dana Dimmick Scarp and machine quilted by Gladys Schulz. The quilt pattern is by Colourwerx, designed by Linda & Carl Sullivan. During my recent visit to Kodiak Island, AK, I went to the Baranov Museum. 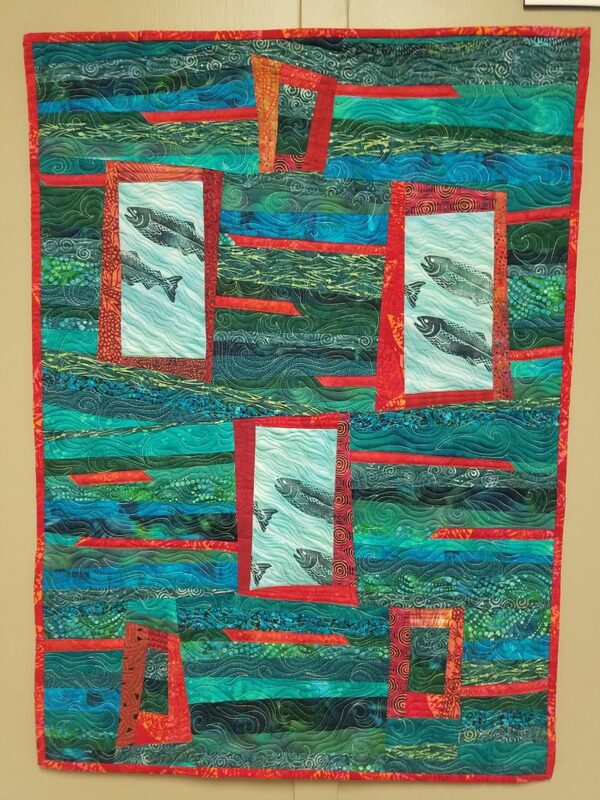 These two salmon quilts were hanging in the gift store for sale. Both are made by the same local artist, Sally Troxell. The fish panels are made from Shibori dyed fabric, printed with hand carved stamps using Daniel Smith oil-based water-soluble ink. Commercial prints surround the panels and the quilts were machine quilted on a domestic sewing machine. The Reeds, depicts seven salmon swimming through the reeds. The River, shows the salmon swimming upstream. The combination of watery colors punctuated with orangish-red make beautiful settings for both of these quilts. The quilting designs add to the pleasing effect. Salmon play an important part in this corner of the world and Kodiak Island is a hub for the fishing industry. There are reminders of this all over the place. 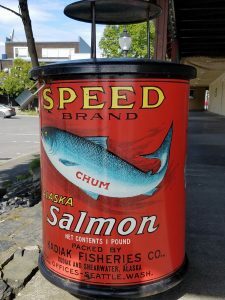 In downtown Kodiak, the garbage cans are made to look like the salmon cans from the 1950’s. Here’s an example. 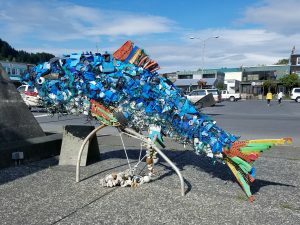 The large salmon sculpture by the harbor is made from marine trash from the ocean and designed to draw attention to ocean pollution and the damage that it is causing in the ecosystem. 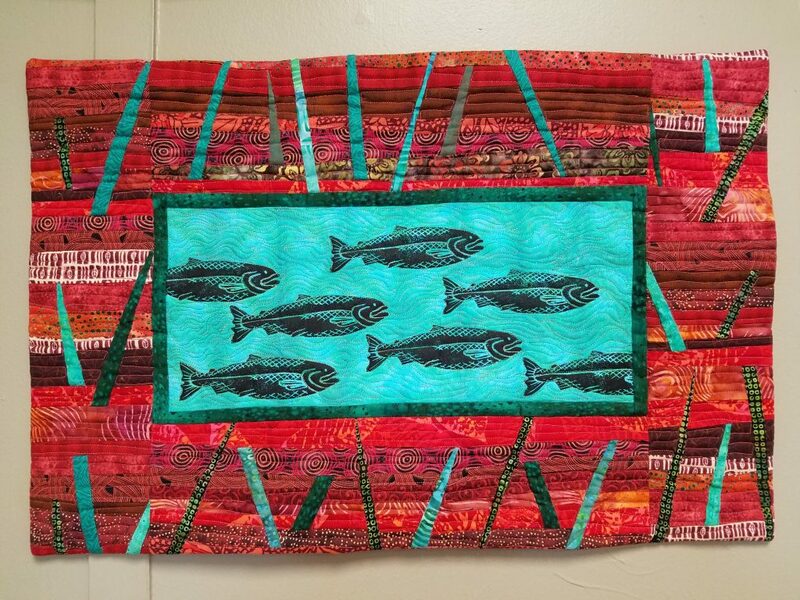 Iqalluk, Alutiiq Salmon was made by art students at Kodiak Middle School and High School with teachers Bonnie Dillard and Marcin Mazurek with support from KIBSD and the AK State Council for the Arts.